Four corner sections surround a larger one. A fun presentation for serving gourmet burger condiments or appetizers for a coffee table. The large lip around this dish makes for easy carrying and drip catching. Functional and beautiful, this handmade, hand polished piece will serve you well for years. Capacity: Small sections measure 4x4x1Â¼ and hold Â¾ cups each. 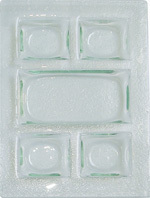 Large section measures 4×8Â¾ x1Â¼ and holds 4 cups. Dishwasher safe. Ships immediately.